Welcome to my review of the Swarovski EL 10×32 Traveler Binoculars. Swarovski is well known in the world of optics, both as being on the more expensive side of binoculars as well as manufacturing some of the best bins out there. How well do the Swarovski EL 10×32 Traveler Binoculars live up to the Swarovski name, though? Let’s find out! The included accessories all show an exacting attention to detail, and are among the best I’ve seen included with a set of binoculars. The carrying case is exceptionally well made, and the neck strap has the thickest padding I’ve ever seen. The lens covers and rainguard are also constructed well, from premium materials. The snap shot adapter allows you to turn your binoculars into a telephoto lens for your camera. Compact digital cameras with a 4X optical zoom or less and extendable objective lens are compatible with the snap shot adapter. You connect it to the right eyepiece of the binoculars, giving you 10X zoom capability for your camera. How Powerful Are the Swarovski EL 10×32 Traveler Binoculars? 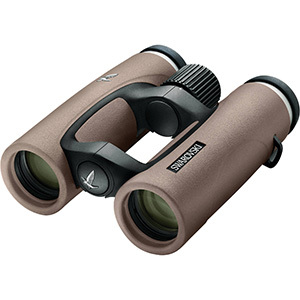 The Swarovski EL 10×32 Traveler Binoculars have a pair of 32mm objective lenses, with 10X magnification. The image clarity and resolution is fantastic, and your subject will look like it’s just feet away instead of further away. You can also focus in on objects as close as 5.4 feet, allowing you to get a really close-up view of objects through the binoculars. What Kind of Optics Will I Find Inside the Swarovski EL 10×32 Traveler Binoculars? Swarovsky has packed the EL 10×32 Traveler Binoculars with roof prisms made from BaK-4 prism glass. The objective lenses have fluoride-containing HD (High Density) extra-low dispersion glass, allowing the lenses to better control the wavelengths of light and reduce chromatic aberration in the image. What does this mean? It means an image that is sharper and has little to no color fringing. The optics on the Swarovski EL 10×32 Traveler Binoculars are fully multi-coated with Swarovski’s patented Swarotop and Swarodur coatings, a cocktail of multi-layered, wide-band anti-reflection coatings that cut down on the unwanted reflections from the surfaces of the lenses that can reduce light transmission. The end result is a set of binocs that provide you with 90% light transmission without lens flare or any detraction from the image quality and brightness. The field of view on these binoculars is an astonishing 360 feet at 1,000 yards, which is one of the widest fields of view I’ve ever seen in a 10X binocular. The eye relief is 20mm, which is excellent news for those who wear eyeglasses. The focusing wheel is centrally located, and is very easy to adjust to get a finely focused image. The eyepieces feature diopter adjustment, in case you want to use the bins without your eyeglasses. The adjustment allows for +/- 5 diopters of compensation, with 7 diopter correction at infinity. The main housing of the Swarovski EL 10×32 Traveler Binoculars is made from a magnesium alloy, which allows the binoculars to be lightweight and strong without any worry about corrosion. The bins are designed with an open bridge design, allowing you a healthy amount of hand space to hold your binoculars when you aren’t using the neck strap. The Swarovski EL 10×32 Traveler Binoculars have a rubber armor coating that covers most of the housing, protecting the optics inside and giving you a more secure surface to grip. It’s approximately 1mm thick, and very hard, so it’s not as “grippy” as some binoculars. With that said, I never had any problems keeping a grip on these binoculars. The one drawback to the Swarovski EL 10×32 Traveler Binoculars is a lack of a tripod mount. I would have loved to see the ability to mount these bins on a tripod or monopod, but Swarovski chose not to include that in this model. The Swarovski EL 10×32 Traveler Binoculars are quite durable, constructed to be both waterproof and fogproof. The body is fully sealed with O-rings, and the barrels have been nitrogen-filled. The objective lenses are set about 9mm inside the ends of the barrels, a fairly deep set that definitely helps protect the lens. It also helps prevent lens flare, since the barrels can act as lens hoods. Thanks for reading this review of the Swarovski EL 10x32 Traveler Binoculars. These might be expensive binoculars, but they are supremely made and well-suited to any task. Whether you're birdwatching, hunting, on safari, or just want an excellent set of binoculars to bring the action closer to you, these fit the bill.